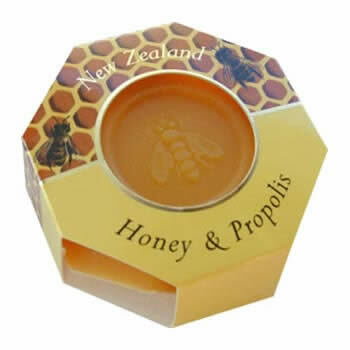 Composition and description: Propolis honey is a product obtained from honey bees and propolis. Product rich in vitamins B1, B2, B3, B6, B12, C, D, A, biomineral (Zn, Ca, Mg, Fe, Cu, K, P), bioenzime, antifungal and antiseptic substances. The role of this product in the body is complex, the action was due to both the bee honey as well propolis, two of natural products derived from bees. Bee honey, besides its contribution in vitamins, enzymes, mineral salts, comes with a large amount of directly assimilable monosaccharides, such as fructose and glucose, being an energy product par excellence. Under the aspect of sugar content, honey is an excellent tonic in fatigue, physical fatigue, muscular effort and the nature of the sugars contained a significant food with dietary properties. Propolis, purified and brought in the form of soft extract, comes to enrich the compound of mineral substances with balms, essential oils but especially with a large amount of flavanols, basic constituents of propolis. Propolis has antibacterial properties, baeteriostatice, topical and regenerators. The variety and complexity of the substances contained propolis honey, put this product among natural products which stir great interest among consumers. The antiinflammatory action and cicatrizing for - Respiratory: nasopharyngitis, tonsillitis, laryngitis, tracheobronchitis, bronchial asthma; - mouth: stomatitis, gingivitis, thrush - urinary disorders: diuretic effect in cystitis, pyelocystitis, nephritis. It is an exceptional anti-infective remedy for throat and airway, having and very strong immunostimulatory effects. Take three tablespoons each day, after meals, then for 30 minutes, do not eat anything. 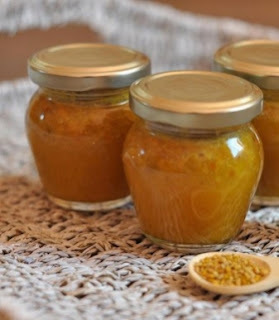 Each teaspoon of honey is held in the mouth until dissolved and slowly slip down your throat, so to exercise the full anti-infective effects on this area. The composition is not recommended for pregnant women and children under 3, due to insufficient testing for these categories.